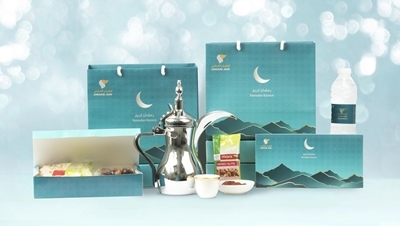 Oman Air, the national carrier of the Sultanate of Oman, has reintroduced its special inflight offering for its valued guests observing Ramadan. In celebration of the holy month, Oman Air’s newly redesigned Iftar Meal Boxes will now be available on selected Oman Air routes from mid-May until mid-June. The Iftar box has been influenced by the truly unique terrain found in Oman and designed to reflect the un-spoilt, natural beauty of the desert and the rugged landscape of the country’s mountains. It contains healthy options of fresh apple slices, an assortment of finger sandwiches, maamoul, packed mixed nuts, laban and dates. Specially designed gift bags are also available for Premium Cabin guests wishing to take the Iftar box away after disembarkation. Furthermore, those passengers flying long haul with Oman Air will be offered the normal inflight meals after the fast break. Oman Air’s Guests Experience and Branding department is deeply committed to offering the highest level of inflight catering, alongside amenity kits and other products. Ramadan is an important religious festival, which is observed by a large segment of our valued Oman Air guests. The reintroduce of this inflight offering illustrates the airline’s commitment to putting its customer comfort and convenience at the heart of its service offering.